This canvas T-top, helm cover, and outboard engine cover were custom designed for this boat. Your boat will be well protected from the elements when you keep it covered with a boat cover like this one made of Sunbrella marine canvas. Your boat is not only a major investment, but it's probably one of your favorite recreational activities. You can help maintain your boat in good condition and retain its value by protecting with a quality canvas boat cover. 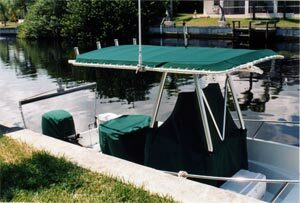 Boat covers are an affordabe way to protect your boat and its onboard equipment and gear. You can use canvas covers for a sailboat cover, outboard engine cover, fender cover or any other type of marine canvas cover, and a quality custom marine canvas shop is your source for quality workmanship and materials. A ready-made or custom-designed boat canvas cover will provide you with years of protection for your powerboat or sailboat and its fittings. Boat covers protect your boat from the harmful UV rays of the sun and keep the fiberlgass, plastic, upholstery and other parts from getting dried out and brittle from the sun. The sun will break down plastic and rubber parts, fade the upholstery, damage fuel lines and other hoses, and cause all manner of damage. A cover also keeps out bird droppings, leaves, and airborne dirt and debris, and prevent rodents and other small animals from nesting in your boat. The best marine canvas covers are custom-designed for a perfect fit. The fabricator will come out to your boat to take measurements, then hand-fabricate your covers according to your needs, to professionally fit and install your new boat canvas cover, using Sunbrella brand marine canvas so that your custom boat covers will be durable, fade-resistant, and tough enough to withstand severe sun and weather conditions. Sunbrella fabrics are woven, which keeps them from trapping heat and moisture, and are resistant to tearing, shrinking or mildewing. 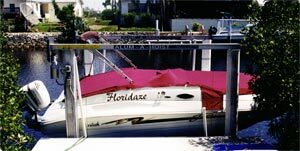 More affordable ready-made boat covers can be purchased for a specific make and model of boat. If you haven't performed modifications to your boat that would interfere with the fit of the cover, you can buy a fitted canvas cover designed for your specific boat. Finally, there are universal covers, which generally are made for certain boat sizes and types but aren't custom-fit for a specific make and model. These universal covers cost significatnly less than custom-fit boat covers. They generally use drawstrings and elastic to tighten the cover to the boat. 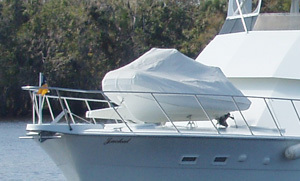 These types of covers can be used to cover your boat while its moored or sitting on its lift or trailer, but are generally not suitable for trailering your boat, because the fit isn't sufficiently tight to keep road wind from getting underneath and destroying the whole cover or pulling it off completely. Quality boat canvas covers offer protection from rain and from interior moisture build-up inside your boat. Additionally, covers keep dirt and other debris from getting into the boat, and help keep out rodents, birds, and other invaders that will damage your boat. For whole-boat protection, nothing beats a mooring cover to protect your boat from bowsprit to stern. Whether you're mooring your boat in the water, trailering it on the highway or keeping it on a trailer or boat lift behind your house, a mooring cover will protect your boat against the elements. Custom bimini tops and T-tops will provide shade for you and your crew and guests during the south's year-round sunny season. And anything you choose to cover on your boat will look better and last longer when you keep it covered with a top-quality handmade canvas boat cover. Boat Covers for Trailering: If you will be trailering your boat, be sure that the cover fits the boat snugly all the way around. Pre-made boat covers are often not suitable for trailering, due to a looser fit. Always tie down the boat cover to the trailer itself, and use straps, not bungee cords, so that you can cinch it down tight. The cover, particularly around the front of the boat, should be tied down so that the edges don't flutter while trailering, and also to keep wind from getting under the edge and into the boat, which will cause parachuting. Fluttering and parachuting can destroy the cover quickly, and parachuting can end up blowing the cover off the boat and into the traffic behind you. Your sails will last longer and look better with a custom sail cover. Your custom-made sail cover will fit your boat perfectly, whether she's a schooner or sloop, with full batten sail, even with a Dutchman or Lazy Jack system. Regardless of what type of cover you buy for your boat, there are certain features you should look for in any cover. UV Resistance — The cover is there to protect your boat from the sun. Do we really need to point out that the cover itself should be resistant to the sun's damaging rays? Mildew Resistance — Any moisture that gets on or under the cover should not be allowed to produce mold and mildew. Waterproof — Your boat cover should keep rain out of your boat. Elastic or Drawstring Bow Tightener — An elastic band or drawstring to tighten the cover snugly around the bow of the boat will allow you to tighten the rest of the cover as taut as possible, thus maximizing the cover's effectiveness. Trailerability — If you trailer your boat, your cover should fit your boat snugly and should have straps or tie-downs to secure it tightly. Reinforced seams and corners — The cover should be reinforced at the seams and corners and at all stress points. Rust-Resistant Grommets — All grommets and any other hardware on the cover should be resistant to rus. The best sail cover shops are experienced in designing, fabricating and installing all types of custom marine canvas covers, for powerboats and sailboats ranging from dinghies to yachts, and most types of covers are also readily available pre-made to fit your boat or other equipment.